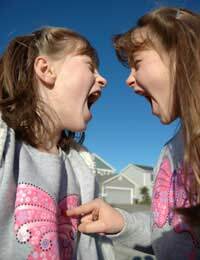 Sibling rivalry within a family is an inevitable part of growing up, and is thankfully perfectly normal! However, endless arguments and fights between children can get very tiresome and exhausting and it is a good idea to try and find a positive way to manage your situation. The occasional spat between children-particularly those who are very close in age-is to be expected. It happens in every family and really is part of life. The odd argument or even fight between siblings is irritating but manageable, however the situation becomes increasingly serious and difficult to cope with when one child becomes utterly convinced that their parents have favourites and are taking sides with their brother or sister. If a child really starts to think that their parents do have a favourite, this will impact heavily on the family unit and lead to endless fights, arguments and issues. All children are different and have different strengths, weaknesses, qualities and flaws in their characters, but this is not a reason to develop a stronger bond and affection with one child than another. All children need to have their achievements, worries and concerns acknowledged and children in the same family deserve to receive an equal amount of time, love and attention from their parents. Children who feel they are not getting the attention they need or deserve, but think their siblings are will always react and respond by changing their behaviour. They may take it out on their parents, their siblings or their friends and may well start to behave differently at school. Watching your children’s behaviour closely is one way to try and nip any changes in the bud. This may mean altering your own behaviour as much as you encourage your child to adapt theirs, and it is crucial that you take time to listen to your children. It is very easy to dismiss the worries and behavioural changes that your children want to talk to you about, but often their concerns will centre on their siblings. They may feel that they are not as clever, attractive, likeable or loved as their brothers and sisters and this will make them feel sad, rejected and isolated. In a busy household, work, school and other activities make life hectic and frantic and often leave precious little time for families to communicate properly with each other. It is really important that each child in the family receives an equal amount of time, affection and attention so that they do not feel left out or not important enough. Make sure that you validate their feelings and concerns by taking time to listen to them and reassure them that there are no favourites in the family, and that every child is loved and considered equally. Insecure children may lack confidence and deal with their feelings by behaving badly, both at home and school. This typical attention seeking behaviour can often be attributed to a child feeling left out, because they think they are not important enough within the family unit. Perhaps they have a brother or sister who is incredibly good at maths, or an outstanding sportsman, musician or artist. Perhaps their brother or sister is incredibly popular and has lots of friends and is brimming with confidence, whereas they are shy and find making new friends really hard. All of these things can cause a child to feel that they are not good enough, and therefore they will need lots of reassurance. All children need time and attention from us and those who suffer from sibling rivalry probably need it more. All our children have qualities that make them shine in one area or another, and they need to be reminded of this and praised so that they feel totally included in the family.